Coping with new business paradigms whilst continuing to grow the business in an ever increasing regulated world, will be pressurising your operational excellence and risk management. 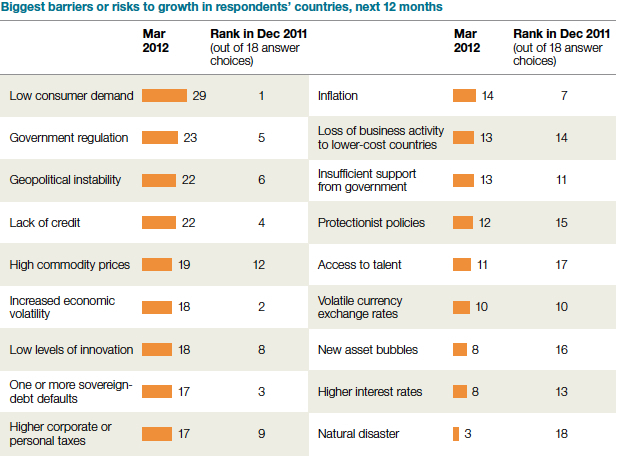 Today a larger share of global executives expect economic conditions to improve in their own countries compared with the first quarter of 2012. Although worries about sovereign debt defaults have come down, concern about rising commodity prices and geopolitical instability are up since December. Lack of credit, increased economic volatility and higher corporate or personal taxes also made the top 10. Interestingly, despite the recent rise in long-term interest rates, fear of higher rates came in second-last among executives' major concerns. Understanding the changing world of our CXO’s and the need for relevant information rather than data, has enabled ATTEYA UK to produced a class leading Business Intelligent solution (ApplStream®) to assist CXO’s and their team in keeping them accurately and timely informed of their business performance. Wasting your time waiting for systems/processes is unacceptable. Our new DNA technology enables CXO’s to autonomously be in control of their own bespoke information requirements immediately. See the complete business picture. Our solution enables you to see the summary of information, but also drill down to the detail when required and display it in a graph of your choice for further communication, all at a click of a button. In this fast changing environment confidentiality is paramount. With our design CXO’s are able to solely review confidential information. Cost savings. Usually reporting information to CXO’s is dependent on IT specialists or processes involving specialists to produce and deliver. Our solution is designed on a self explanatory environment so you produce your own information directly from your live database.